Knowing who you are, what core values you own, what your talents are, and how to strengthen those strengthen you as a person in your surrounding, at home as well as at your job. The DaVinci Academy wants to contribute to strengthen teachers. Teachers with excellent competencies, knowledge, skills, and good vision for talent are the core of high-quality education. We appreciate diversity between people, because differences more than similarity can complement one another. Core values in schools contribute to a positive school climate. Well being and involvement are starting points for learning. Therefore, values and talents of the children can be further developed. Children can enhance their performances in which they can focus and build confidence. The DaVinci Academy achieves these goals. Thousands of students and teachers from primary education followed our presentations, trainings, and seminars. The Academy strives for high quality materials. We want to strengthen teachers, children, and the school surroundings and we do that together. The DaVinci Academy focuses on long-term development. We work together with universities, companies, and cultural institutions to achieve high-quality education. High-quality education suitable for everybody while respecting and nourishing talent, intelligences, and ambitions. We are decisive, daring, and original. 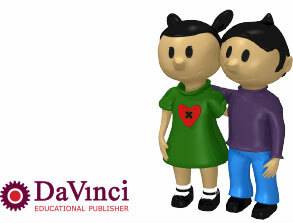 The DaVinci Academy resulted from DaVinci Education: the educational publisher for primary education with integrated subjects. Integration of subjects, within the team, and within the school. The pedagogy, didactics, and philosophy can be found at the following Dutch website www.wereldverkenning.nl. The DaVinci Academy: for knowledge and skills from inspiration, enthusiasm, and quality.